Parents want their child to learn music. However, they don’t know how to do encourage them or make them fall in love with the instrument. Although it is not possible to teach your child love guitar, you can lead them to the path. Remember that guitar is a tough instrument for any child to play. They need to literally dig their fingers into those strange steel strings, create indents, and develop some unsightly calluses. The process is lengthy. And the child needs to hurt his finger on a guitar. Once you admit your child to a reputed music academy and he had attended his first lesson, it is your time to keep the passion burning within him. Most parents tend to cover the guitar in its case, once it is used. Well, this might be a dedicated effort to keep it safe and increase its life. However, hiding it will give your child a reason not to play it. The instrument will appear too hard to reach. Make guitar accessible and inviting, just as toys, snacks and television are. Store it at a spot where your child can simply pick it up and start playing. Focus on giving the music a very strong presence in your household. Well, this may sound crazy for most parents are they may not be musicians, but it won’t hurt playing the instrument for some time when in house. Try to keep music on in the house as far as possible. If you are interested in learning music with the child, simply go ahead. Speak to your child about his or her favorite types of music. This needs to be a very natural and fun process. These little efforts will act as motivation for your child. 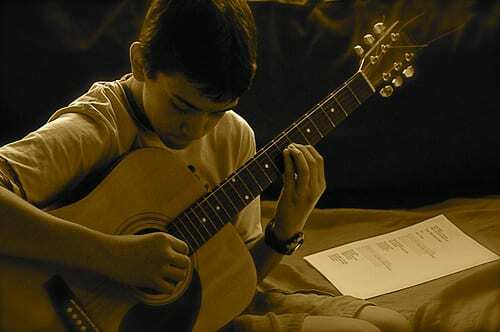 Never let your child feel that playing guitar is a task that he must do every day no matter what. This will sound like some homework. And we all have hated doing homework as children. So if your child is practicing guitar at home and you feel it sounds bad or like some head-breaking blast, that’s fine. As lessons get more difficult, your child will learn correct vocabulary, techniques and theory of music. Initially, it is crucial that your child simply takes the instrument in their hands. Do not force him to play. Practicing guitar should never be treated as school homework. If you are serious about making your child love guitar, it should not feel like a chore. This is crucial for your child’s overall development and establishing a connection with your child with a guitar. Let your child practice alone. Let your child practice in a common area where a number of people are present may seem to be a little awkward. Being alone will help them mess up the way an as much as they wish to. It is better to ask the child what’s more convenient for him or her. In case, they are comfortable practicing a common room, it’s fine. But if they aren’t you must help them out. Playing music is joy. It is known to be one of the most beautiful and amazing human feelings one can experience. As little children advance in their age, they require some discipline. They may require preparing for a special performance, an audition, or a tough competition. These activities may add up some amount of stress to their life. Hence, it is crucial that you help them love guitar even before they start learning it. This makes sure that the future experience gets more rewarding than stressful. Once they develop a feeling of love and passion for the instrument they play, nothing can stop them! Is your child interested in learning guitar? Search for a music academy or guitar teacher at taalmusicacademy.com/courses/ now!